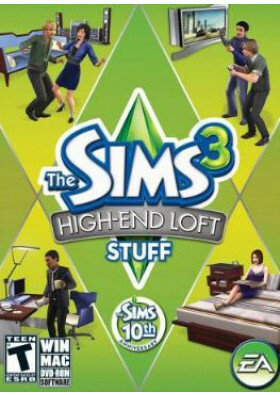 Transform your Sims’ homes into sleek, edgy lofts with The Sims 3 High-End Loft Stuff. With a host of new items for the most lived-in rooms in your Sims’ homes, including slick gadgets for your high-tech home office, a next-gen gaming system for the killer game room, modern furniture for the most contemporary living room, and more, your Sims can now give their homes an ultra-modern makeover! After you modernize their homes, turn your attention to their wardrobes and give them an overhaul with sophisticated, cutting-edge fashions. Whether it’s your Sims themselves or their homes that needs a new look, The Sims 3 High-End Loft Stuff lets you catapult your Sims into a more modern, loft-inspired lifestyle!